Posted by Grace Sue on 4/11/2019 10:32:19 AM. If you have multi-hour long audiobooks, obviously you can't sit and listen for 10 hours or more time. So you totally need to cut the audiobook into chapters. Then choose any chapter you want to listen to. After splitting, the audiobooks will be read as the books, whenever you want to listen, you can access to the recent chapter. 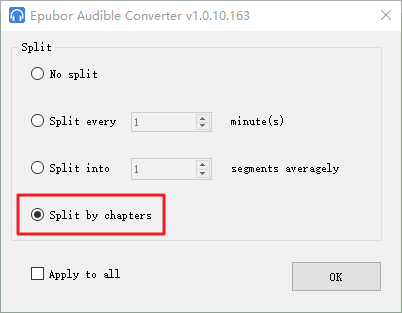 The following ways can Split Audiobook into Chapters and create audiobooks with chapter divisions easily. Epubor Audible Converter is the best aa/aax to mp3 converter to remove Audible DRM and convert Audible aa/aax to mp3/m4b with 100% original quality preserved. Also, it can help you easily split your large audio files into several chapters. Launch Epubor Audible Converter. You can click “Add” to navigate and locate your audiobooks or simply drag and drop them into the software interface. If you are in need of splitting your audiobooks into chapters, Audible Converter must be your first choice. It enables you to split big Audible file into small parts. You can just click on the "option" button to split by time, by chapters or into segments averagely. Also you can tick "Apply to all" if you want to apply your option to all Audible books. 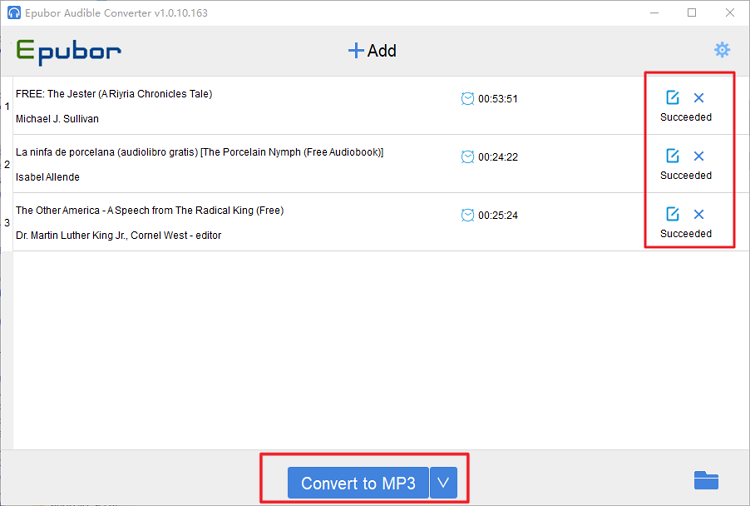 Then click on "Convert to MP3" or "Convert to M4B" button at the bottom to start the process of removing DRM and converting your audiobooks to mp3. Epubor Audible Converter helps you easily unlock and convert Audible books at the same time. Once it has finished, "Succeeded" will appear. Also, the folder holding the converted MP3 files will automatically pop up. Compared with mp3, m4b audiobooks allow you to store digital bookmarks which make it easier for you to jump to the point where you last left off. And also the m4b format is more suitable than mp3 for an Apple device like iPhone, iPod, iPad or MAC since it's specially used by iTunes to store audiobooks. Follow this guide to convert Audible aax/aa to m4b: Ultimate Way to Convert Audible to M4B [Infographic]. Epubor Audible Converter can satisfy your demand for splitting Audiobooks into chapters on the premise of decrypting the DRM and converting them to MP3 simultaneously. There are some other methods you can take to split your audiobooks, like the following 3 ways I'm going to share with you. But what should you do first before splititng is to ensure your audiobooks are DRM-free. Therefore, I sincerely suggest that you could utilize Epubor Audible Converter to meet one-for-all needs. In Audible.com the audiobook that is over 12 hours can be downloaded in multiple parts. You can get several parts of one audiobook. But this function is invalid in the audiobooks shorter than 12 hours. How inconvenient! But half a loaf is better than no bread. For a computer, you can download it with several parts from the Audible Library. For android or IOS, tap "Settings" and click download settings. Then choose to download audiobooks with "Single-Part" or "Multi-Part". Check the detailed official ways about How to Download Audible audiobooks in Multiple Parts. No matter a Mac or Windows system, iTunes is used frequently. Here is the way for you to divide Audible audiobooks into chapters with iTunes. According to below steps, you can add chapters to audiobooks with iTunes and listen conveniently. You can use iTunes to play Audible audiobooks. But if you want to split Audible audiobooks into chapters, you must Download Epubor Audible Converter to remove DRM and convert Audible to MP3 firstly. For a mac, generally, there is no need for you to install iTunes again. It is a built-in app on a Mac. Or you can install it from Apple Store. For Windows system, you can download iTunes from Apple official site. Then install iTunes on your computer. Launch iTunes. Select "Music" tab. Click the "File" on the navigation. Then click "Add File to Library" or "Add Folder to Library" option. Select the converted MP3 file or folder from the pop-up window. Then the MP3 file will be displayed in "Recently Added" section of Library. Play the added MP3 file in iTunes. Remember the time of each chapter you want to begin. Right-click the MP3 audiobook and click "Get Info" option. Then click "Options" from the pop-up menu. Enter the start time and stop time of a chapter. For the first chapter, the start time is "0:00". The stop time is the timing you want to end a chapter. After enter and check the check box. Then click "OK". Click "Edit" on the navigation bar and choose "Preferences" option. From the "General Preferences" window, click "Import Settings" option. You can ignore other default options. 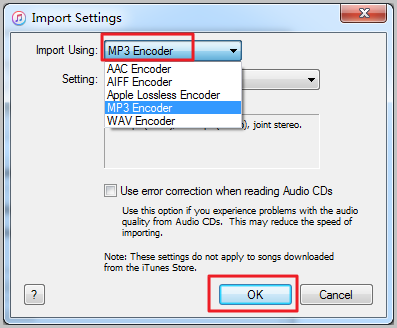 Then set the "Import Using" as "MP3 Encoder" from the pop-up window. Then click "OK". Here you can find AAC/AIFF/WAV/MP3/Apple Lossless Encoder. And you can choose the format you like. Select the added MP3 file again. Click "File" option in the navigation bar and put your mouse on the "Convert" Option. 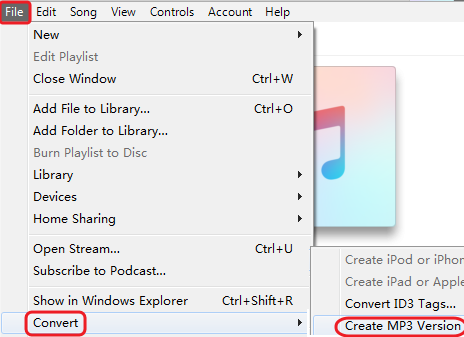 Click "Create MP3 Version" option from the pop-up menu. This operation will create a new MP3 file which contains the content of the time period you selected. After conversion, you can find the new MP3 file in "Recently Added" section. Click the name of the new file and rename it as "Chapter One". Now you get the first chapter in Music section. Right-Click the Chapter One file. Select "Get Info" option from the pop-up menu. Click "Options". Change "media kind" from "Music" to "Audiobook". Then click "OK". You will find the Chapter One file disappears in the current interface and appears in "Books > Audiobooks" section. For more chapters, you can repeat above steps from Step 4. For Chapter Two, you can enter the start time one second later than the previous stop time. Let me illustrate. Chapter One, enter the start time "0:00" and the stop time "3:00". Then Chapter Two, enter the start time "3:01" and the stop time you want to split. You can right-click these chapter files and choose "Show in Windows Explorer" to find the split chapter files in your computer. It's easy for you to create audio books with chapter divisions using this way. Audacity is a freeware and has full versions for different computer systems. If you want to cut audiobooks into chapters, it's a good partner. MP3, AIFF, WAV, FLAC and other output formats are provided for you. First of all, for Audible audiobooks, please Convert Audible AA/AAX to MP3. If your audiobooks are open files, just skip to below steps. Select the appropriate version for your computer. Download Audacity. You can download the installer file and the zip file which is a portable version. Choose your favorite one. Launch Audacity. Click "File > Open" to import audiobooks. 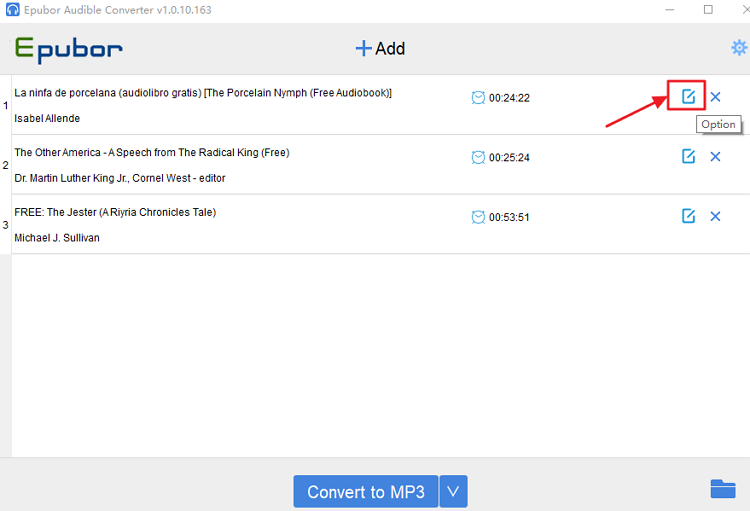 Or click "File > Import > Audio" to add audiobooks into the interface. Play the added audiobook and determine which timing to split. Below the "Audio Position", you can find the current timing number. Once you want to split, stop playing and edit the timing number into the "End" box. The timing you want to start a chapter can be edited below "Selection Start". Click "File > Export Selected Audio" on the navigation bar. From the pop-up window, select the format of selected audio and storage location. Also, you can rename the selected audio file. For next chapter, enter the timing you want to begin below "Selection Start". Choose another stop timing. Now, with above four ways to split audiobook into chapters, you can flexibly arrange the listening time. You may find the first one is the most efficient and the easiest way to split your audiobooks into chapters. That's right! With the help of Epubor Audible Converter, you can not only easily remove Audible DRM and convert DRM-protected AA/AAX books to MP3/M4B, but also split large Audible files into several segments on the basis of your own needs. Doesn't it attract you? Let's start! Why do you want/need to split the books into smaller parts? With larger segments, especially the full book, you can always see how much more is left. And if you use the sleep timer, you know you set it for say 20 minutes and you can easily go back up to that amount to restart. Can you actually split them into chapters? And if so, why does it matter? Maybe I read differently. I read/listen until I fall asleep or have to do something else. I never care where I am in a chapter. I really hate the books that are split into several minutes. They are so difficult to manage. If you are streaming them then go into a dead-zone, such as the 20 minute one I have on my hike, many times I can't listen to my book during that time period. This very much depends on apps that you are using. iTunes prefer one big file m4b which is basically MP4 container with AAC encoded audio and chapters metadata. However there are other apps for which its better to have chapters separated into individual files. And these apps can cache several files ahead or whole audiobook. I find that I need to split the file because the car cd player doesn't have many options. The choice is to continue or start from the beginning - no way to jump forward to remaining audio after cd has been ejected. Chapters would allow continuing where I left off. you can automatically convert whole library. Opus is great format for audiobooks with 48 kbps bitrate in same quality as 128 kbps mp3 (eg. 1/3 of space/bandwidth). T h i s w i l l a l l o w t o d e t e c t p i e c e s o f a u d i o b e t w e e n p a u s e s ( s i l e n c e ) . I i t i s g o o d a t s p l i t t i n g t h e a u d i o f i l e i n t o m e a n i n g f u l p a r t s i f n o t e x a c t l y c h a p t e r s . I t h i n k i t i s b e t t e r t h a t d e c i d i n g o n a f i x e d a m o u n t o f t i m e a n d h a v i n g a u d i o e n d a b r u p t l y m i d - s e n t e n c e .
T h e s i l e n c e i n t e r v a l I u s e i s 2 . 4 s e c o n d s , o t h e r s e t t i n g s I l e a v e o n d e f a u l t .
T h e t o o l w i l l a d d a s e r i e s o f l a b e l s w h i c h c a n t h e n b e u s e d a s b a s i s t o s p l i t t h e b i g f i l e i n t o s m a l l e r p a r t s .
Do you have any thoughts that might help? I'm not sure what's wrong with your "other players" but I guess maybe you can try to edit the "settings", maybe it will help you. Or you can also visit the official website support center for help about that player. i recommend the most professional MP3 splitter - Avdshare Audio Converter to help you.